If the interpretation of the last verse of ch.14 is correct, it left us in the middle of a gruesome lake of blood, measured “by the space of a thousand and six hundred furlongs” and at least six feet deep. That took place after “the sixth angel sounded” his trumpet and John “heard a voice from the four horns of the golden altar . . . saying to the sixth angel which had the trumpet, Loose the four angels which are bound in the great river Euphrates. And the four angels were loosed, which were prepared for an hour, and a day, and a month, and a year, for to slay the third part of men” (Revelation 9:13-15). That will be the bloodiest conflict this world will ever witness during premillennial time. It is the battle of the sixth trumpet, sixth angel (Revelation 9:12, 13), or second woe (Revelation 11:14) in which a “third part of men” are “killed” (Revelation 9:15, 18). Since that took place during the “second woe” (after the five literal months of the first woe or fifth angel of Rev.9:1-11) one more “woe,” the “third,” remains. Referring back to Revelation 11:15, when “the seventh angel sounded . . . The kingdoms of this world” will “become the kingdoms of our Lord . . . and he shall reign” instead of Satan who was in control during the time of the previous six trumpets inclusive of the first and second woes. Then John hears the acclamations of praise and adoration from the 24 Elders who “fell on their faces and worshipped God” because He “hast taken to thee thy great power, and hast reigned” (Revelation 11:15, 16), meaning that God was not reigning during the previous trumpet scenarios but had relinquished the “key of the bottomless pit” to the fallen “star” whose “name in the Hebrew tongue is Abaddon, but in the Greek tongue hath his name Apollyon” (Revelation 9:1, 11). Now, when “the second woe is past” and “the third woe cometh,” He takes the “key” back out of the unwilling hands of Abaddon. Although this made “the nations angry” (Revelation 11:18), it is really their master, Abaddon, who is angered. The “nations” merely reflect the emotions of their satanic master. Then, whether the “nations” know it or not, the “third woe” will usher in “the time of the dead, that they should be judged” and God will “give reward unto [His] servants the prophets, and to the saints, and them that fear [His] name, small and great; and shouldest destroy them which destroy the earth” (Revelation 11:18). At this point, during the end time scenario of the “third woe,” “the temple of God [will be] opened in heaven, and there [will be] seen in his temple the ark of his testament: and [there will be] lightnings, and voices, and thunderings, and an earthquake, and great hail” (Revelation 11:19). The parallel to the “lightnings, and voices, and thunderings, and an earthquake” and especially, the “great hail” referred to in Revelation 11:19 is repeated in more detail in Revelation 16:17-21 were we again find “voices, and thunders, and lightnings . . . a great earthquake . 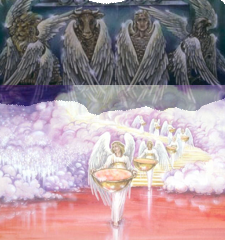 . . and a great hail out of heaven” which should convince us that the “seventh [trumpet] angel” and the “third woe” is inclusive of all seven of the “seven last plagues” introduced in Revelation 15:1. With that background in mind, we are prepared to explore chapter 15. Verse 1: And I saw another sign in heaven, great and marvellous, seven angels having the seven last plagues; for in them is filled up the wrath of God. The Commentary, on the word “another,” suggests this is a “reference to the sign mentioned ch. 12:1” where “there appeared a great wonder in heaven; a woman . . .” But, here we see “seven angels” instead of a “woman.” Another, more likely parallel would be the “seven angels” of Rev.8:2. However, they were given “seven trumpets” instead of the “seven plagues” we see here. But, having reviewed the three woes in our introduction, it should be obvious that the last trumpet is also the third woe (see Rev.8:13) which is also all seven of the seven last plagues referred to here. Consequently, it would be reasonable to make verse 1 of this chapter verse 21 of the previous chapter. Such a simple rearrangement would make clear that the “seven last plagues” follow immediately after the previous six trumpets are sounded. Check out this illustration showing that the seventh trumpet/third woe is inclusive of all the seven last plagues. So, going back to Rev.8:2, “To them were given seven trumpets. The Lord was going forth to punish the inhabitants of the earth for their iniquity, and the earth was to disclose her blood and no more cover her slain.” Up to this point, during the previous six trumpets, the earthly inhabitants were being punished indirectly by God because He left them to suffer under the power of Satan (“Wormwood” and “Abbadon” the “destroyer”). As you recall, “Wormwood” was the one whom the earth dwellers now anticipate a thousand years of peace and prosperity after their great victory of the sixth trumpet (see Rev.9:12-17 and 11:8-13). However, because of the seven plagues that are about to follow, their joy will will soon turn to grief and terror (see Rev. 8:13) feeling that God is angry with them and must be appeased. Again, up to this point, while the first six trumpets were sounding, inclusive of the first and second woes, the “wrath of Satan” was being experienced. Now, “the wrath of God” is about to be unleashed by these “seven angels having the seven last plagues” which will finish “the mystery of [who] God” really is (Revelation 10:7). The Commentary suggests the phrase “seven last plagues” should be “seven plagues, the last.” Such rewording would imply that other “plagues” had preceded these “seven.” Therefore, instead of only “seven” plagues, all of them together add up to a total of thirteen! Remember that the seventh trumpet is a transition point between the trumpets and the plagues, not another trumpet plague in and of itself. Therefore, the total is 13 plagues, not 14. A short time before, in Rev.4:6, John saw this same “sea of glass” where it is depicted “before the throne” of God the Father, “in the midst” of which were “four beasts full of eyes before and behind.” While there it looked like “crystal,” here it appears as though it were “mingled with fire.” That previous scene came to John after Jesus bade him “come up hither, and I will show thee things which must be hereafter” (verse 1). He then proceeds to describe things he saw in the heavenly sanctuary. We have already concluded that blood and incense in the sanctuary represent mercy, while the horns and fire in the altars represent God’s justice. Therefore the “sea of glass” reflecting “fire,” and in the context of the seven plagues of verse 1, certainly suggest that the time of God’s justice has arrived. Strangely, it could be inferred here that God’s people are in heaven, standing on the “sea of glass” even while the “seven last plagues” depicted in verse 1 are being poured out! But, that test came only to those who were living during the final hours of earth’s history when the Investigative Judgment had passed from the dead to the living. They are depicted in Revelation 7 as the 144,000 and the “great multitude” who received “the seal of the living God” and who had come “out of [the]  great tribulation . . .,” “time of Jacob’s trouble,” or the seven trumpet scenario. So, this verse gives special recognition to those who were living when the judgment turned from the dead to the living. Some of them had lived on into the time when “the four winds of the earth” had been released just after “the servants of our God” had been “sealed” with “the seal of the living God . . . in their foreheads” (Revelation 7:1-3). Others, however, who refused to render homage to “the beast, neither his image, neither had receive his mark upon their foreheads, or in their hands,” were “beheaded for the witness of Jesus, and for the word of God” (Revelation 20:4). Even though their lives were cut short before the “time of Jacob’s trouble” began, they will certainly be seen standing on the “sea of glass” along with the others who lived through that time and were translated without seeing death (see 1 Thessalonians 4:16, 17). Both groups, those who were martyred and those who proved faithful throughout “the beast . . . image . . . [and] mark” scenario, are judged victorious. Interestingly, the apostle Paul, after recounting the afflictions of those who were “tortured . . . had trial of cruel mockings and scourgings . . . of bonds and imprisonment . . . were stoned . . . sawn asunder . . . tempted . . . slain with the sword . . . they without us should not be made perfect” (see Hebrews 11:35-40) suggests that the testimony of the living ratifies the testimony of the dead. Both are needed to complete God’s plan of salvation. So, in the final, last day scenario, the ultimate, living witnesses are the 144,000 and the “great multitude” who “came out of [the] great [post probationary] tribulation” (Revelation 7:14). Their living testimony will ratify the testimony of all the martyrs of history, but more specifically, those who were martyred during the final beast, image and mark episode of earth’s history. Verse 3: And they sing the song of Moses the servant of God, and the song of the Lamb, saying, Great and marvellous are thy works, Lord God Almighty; just and true are thy ways, thou King of saints. This “song of Moses” as well as “the song of the Lamb,” must be the same “new song” “sung before the throne” by the “hundred forty and four thousand” accompanied by “the voice as the sound of many waters” (Revelation 1:15; 14:2) which belongs to the “Lamb” in Rev.14:3. 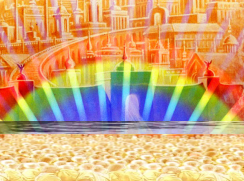 The historic “song of Moses” was sung just after “the children of Israel went into the midst of the [Red] sea upon the dry ground: and the waters were a wall unto them on their right hand, and on their left. And the Egyptians pursued, and went in after them to the midst of the sea, even all Pharaoh’s horses, his chariots, and his horsemen” (Exodus 14:22, 23). The 144,000 and the “great multitude will have gone through a similar experience when the whole world, under the command of Abaddon, the future Egyptian king of the world, will have them cordoned off like caged animals in preparation to annihilate them one and all. Moses’ version of the song saying: “Thy right hand, O LORD, is become glorious in power: thy right hand, O LORD, hath dashed in pieces the enemy” (Exodus 15:6) is much like “Great and marvelous are thy works, Lord God Almighty.” But, Moses’ version, in contrast to this last day version, says nothing about God’s “ways” being “just and true” even though there was no question in the minds of the children of Israel about God’s justice at that time. 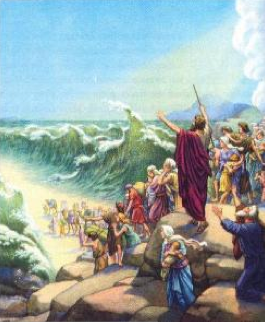 But, it was just a short time later when “they came to Marah” and found the waters “bitter.” Then, “The people murmured against Moses” (Exodus 15:23, 24) questioning God’s justice for bringing them into such a terrible situation! Not so with the 144,000 and the “great multitude.” All doubt and questioning about God’s government will be forever settled in their minds. They will be fully prepared to vindicate His “ways,” saying they are “just and true” and submitting to his rule as the “King of saints” with great joy instead of uttering one complaint after another as ancient Israel did! This is much like Moses’ version saying: “The people shall hear, and be afraid: sorrow shall take hold on the inhabitants of Palestina. Then the dukes of Edom shall be amazed; the mighty men of Moab, trembling shall take hold upon them; all the inhabitants of Canaan shall melt away Fear and dread shall fall upon them; by the greatness of thine arm they shall be as still as a stone; till thy people pass over, O LORD, till the people pass over, which thou hast purchased” (Exodus 15:14-16). But in the final “seven last plagues” scenario of verse 1, which were announced by “the voice of the seventh angel, when he shall begin to sound” his trumpet (Rev.10:7), the Lord says: “the mystery of God should be finished” because this is when His “judgments are made manifest” or plainly recognized. Although the victorious throng standing on the “sea of glass” in verse 2 represents those who gained the victory over the “beast, image” and “mark,” even those who did not gain that victory and received the mark of the beast, will all bow just before they “shall be tormented with fire and brimstone (a thousand years later) in the presence of the Holy angels, and in the presence of the Lamb” (Revelation 14:10). Paul says: “every knee shall bow to me, and every tongue shall confess to God.” (Rom.14:11) Sadly, they will be like those who “gave glory to the God of heaven” only after they were “affrighted” or terrorized in Rev.11:13. This verse is a close parallel to Rev.11:19 where “the temple of God was [also] opened in heaven” when God took to Himself His “great power” and began to reign after “the seventh angel sounded” his trumpet which is also “the third woe” that came very “quickly” after the “second” (Revelation 11:14, 15). As we just learned in chapter 14, it was during the “second woe” that “the winepress was trodden without the city, and blood came out of the winepress, even unto the horse bridles, by the space of a thousand and six hundred furlongs” (Revelation 14:20). That was Satan’s final destructive act during the pre millennial, post probationary scenario of the first six trumpets when he was allowed to demonstrate the unrestrained ruthlessness of his tyrannical government. That scenario began just after Jesus left the “temple” and took His place on the great “white cloud” holding “in his hand a sharp sickle” (Revelation 14:14). During that time, “the tabernacle of the testimony in heaven” must have been closed as suggested by the “mighty angel” John saw whose “face was as it were the sun” which (symbolically here) gives light. He is light to the righteous because they understood exactly what was going on in heaven. Not so with the wicked, who were deceived by Wormwood and Abbadon whom they deified. To them, Christ was “clothed with a cloud” of impenetrable mystery (Revelation 10:1). Now, after “the remnant” of the terrified “men” who were “slain” at the end of the second woe” and “gave glory to the God of heaven,” (Revelation 11:13) the “temple of the tabernacle of the testimony in heaven was opened.” This is the beginning of the “third woe,” which is “the voice of the seventh angel,” to reveal, once-and-for-all, the “mystery of God” (Revelation 10:7) as he comes forth to “destroy them which destroy the earth” (Revelation 11:18). Therefore, the opening of the “temple . . . in heaven” does not mean probation is closed at that time (it was closed prior to the first trumpet as depicted in Rev.8:3-7), but the finishing of the “mystery of God” (Revelation 10:7) when God will reveal Himself, first by means of the “seven last plagues” then literally at the time of His second coming to earth. That revelation will cause the wicked to cry “to the mountains and rocks, Fall on us, and hide us from the face of him that sitteth on the throne, and from the wrath of the Lamb” (Revelation 6:16). 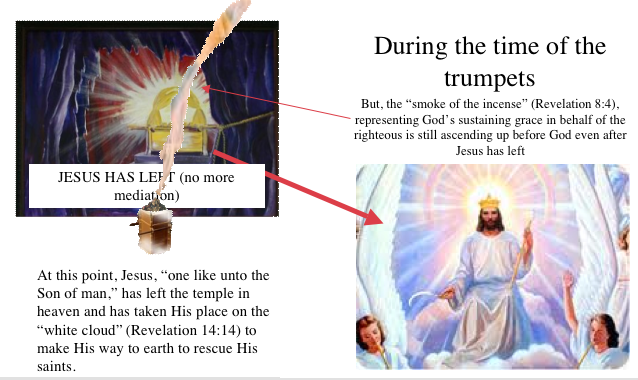 In Revelation 14:17, only one angel is seen coming “out of the temple which is in heaven.” By now, it seems clear that the “sharp sickle” he was carrying represents God’s passive mode of punishment. During that time, God permits Satan to carry out his terrible agenda during the sounding of the first six trumpets inclusive of the first and second woes. Throughout that entire period, the “key of the bottomless pit” had been “given” to the fallen “star” “whose name in the Hebrew tongue is Abaddon, but in the Greek tongue hath his name Apollyon” (Revelation 9:1, 11) the destroyer. Now, when “the temple . . . in heaven was opened” a full complement of “seven angels came out of the temple” bearing “seven plagues” instead of “seven trumpets.” These “plagues” come directly from the hand of God. They represent His active, direct mode of punishment. 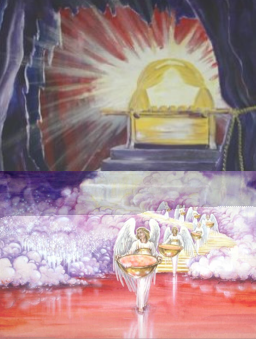 We know this because these angels have “their breasts girded with golden girdles,” the same kind of “golden girdle” worn by “one like unto the Son of man” John saw “in the midst of the seven candlesticks” (Revelation 1:13). Although he was “clothed with a garment down to the foot” instead of “white linen,”  it is safe to assume it was “linen” because the “certain man clothed in linen” (Daniel 10:5; 12:6,7) that Daniel saw with Gabriel, was “the Son of man” (Daniel 12:6,7). Therefore, the clothing of the “seven angels” is identical to Jesus’. But, more than the clothing, verse 1 already said the “seven angels having the seven last plagues,” represent “the wrath of God.” That is in contrast to the first six trumpets which demonstrate the wrath of Satan represented by the “four winds of the earth” (Revelation 7:1). When the “four angels” released them, great harm came to the “earth, sea” and trees” (Revelation 8:7-9). Also note that they all invited us to “Come and see” (Revelation 6:1, 3, 5, 7) when the figures of the “white, red, black” and “pale” horses emerged after the Lamb “opened” the “seven seals” of the record book of heaven. But, more importantly, it appears that one of them may have volunteered to distribute these plagues because we hear no command coming directly from God. As it seems, all of them are really fed up with Satan’s treacherous behavior. They have just witnessed the sixth trumpet scenario where Satan was instrumental in the slaughter of “the third part of men” (Revelation 9:15, 18). Their “blood” even came up “unto the horse bridles, by the space of thousand and six hundred furlongs” (Revelation 14:20). So, it is unanimous with all four “beasts” including the twenty four “elders” that God should intervene. Consequently, they fall on “their faces, and worshipped God Saying, We give they thanks . . . because thou has [now] taken to thee thy great power, and has reigned” (Revelation 11:17). As the Commentary suggests, “This undoubtedly means that the time for intercession is past; no one can enter and have access to the mercy seat. The time of preparation is over; now the time has come for the pouring out of the unmingled wrath of God.” That comment is based on the historicist’s point of view that rules out a future application of the first six trumpets. But, we cannot consistently disregard what we learned in Revelation 8:5. There, it is clear that the actual passing of “the time for intercession” was when Jesus cast the “censer . . . into the earth” just before the seven trumpets began to sound. So, what is the difference between that scenario and this? But, in this case, the word “able” suggests that some (most likely the disappointed followers of Wormwood) made the attempt. Being unmindful that probation was closed, they “gave glory to the God of heaven” (Rev11:13) and wandered “from sea to sea, and from the north even to the east . . . to seek the word of the Lord, and shall not find it” (Amos 8:12), one of the saddest passages of prophecy. Review Revelation 10:1 and 7 again where we first see the “mighty angel . . . clothed with a cloud” that represents the mystery of His identity to the wicked who will have deified two fallen angels, Wormwood and Abaddon. 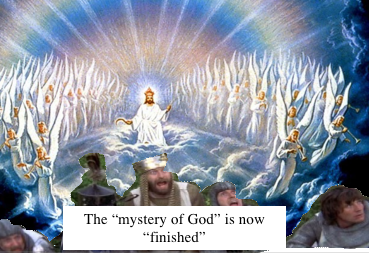 “But in the days of the voice of the seventh angel (or the seven last plagues), the mystery of God should be finished.” Consequently, it is the “mystery of God” that is finished here, not probation, which was finished when Christ casts down the censer in Revelation 8:5. The closing of probation is also depicted when the “testimony” of the “two witnesses” was “finished” (Revelation 11:7), when “one like the Son of man” took His place on the great “white cloud” (Revelation 14:14), and when “Michael” shall “stand up” (Daniel 12:1). Now, after “the temple . . . in heaven was opened” (see verse 5), we see it here “filled with smoke from the glory of God” the Father after “one like unto the Son of man” (Revelation 14:14) departed from His presence, left the heavenly sanctuary and stepped onto the great “white cloud” that will carry Him to the earth at the time of His second coming. Now in Rev.15:8, He will physically reveal Himself and the “mystery of God” will surely be “finished” (Revelation 10:7). Even Abaddon will find himself hiding in the caves along with the people he deceived. “even unto the horse bridles” (Rev.14:20) that is if those strange horses are the same size as ordinary horses! Mrs. White uses this text in Great Controversy page 433 in context with 1844 when Christ left the holy place in the heavenly sanctuary and went into the Most Holy place. But, notice carefully, she only quoted the first part of the text: “’The temple of God was opened in Heaven, and there was seen in his temple the ark of his testament.’ [Rev.11:19. ]” She quotes the entire verse in Battle Creek Letters page 57 when “The Kingdoms of this world are soon to be come the kingdoms of our Lord.” The same thought is found in Manuscript Releases Vol. 20, page 221 where “Not long hence they will receive their reward. Writing of the last days, John says: [Rev.11:19 quoted].” See also Manuscript Releases Vol. 18, page 187 and Vol. 14, page 161. Here is the entire quote from Manuscript Releases Vol.15 page 219: “Thy right hand, O God, shall dash in pieces Thine enemies. Revelation 6 and 7 are full of meaning. Terrible are the judgments of God revealed. The seven angels stood before God to receive their commission. To them were given seven trumpets. The Lord was going forth to punish the inhabitants of the earth for their iniquity, and the earth was to disclose her blood and no more cover her slain. Give the description in chapter 6.” Note the underlined portion that quotes Revelation 8:2 even though no reference is given. If you look it up, the preceding paragraph refers to Rev.16:1 and in the following paragraph, on page 220, she alludes to the “plagues” and the “hail.” Therefore, the least we can conclude is that the context of that quote, as well as the entire paragraph itself, is future. Six satanic “plagues” succeeded by seven last plagues from the Lord comes to a total of “13” plagues. An interesting parallel exists in Joshua 6 where Jericho was surrounded once a day for “six days” (v.3). Then on the “seventh day” they surrounded the city “seven times” (v.4). After blowing the trumpets the wall of the city fell down. So, the six surroundings of the preceding six days plus the seven surroundings on the seventh, comes to at total of thirteen surroundings, the same number of trumpet events we have identified in the book of Revelation. see Last Day Events page 268; Early Writtings page 19; Spiritual Gifts Vol.2 page 54 etc. Some are troubled by the concept that the “great multitude” of Rev.7:9 go through the same time of Jacob’s trouble as the 144,000. Consider this passage: “But while anguish was upon the loyal and true, who would not worship the beast or his image and accept and revere an idol sabbath, One said, “Look up! Look up!” Every eye was lifted, and the heavens seemed to part as a scroll when it is rolled together, and, as Stephen looked into the heaven, we looked. The mockers were taunting and reviling us and boasting of what they intended to do to us if we continued obstinate in holding fast our faith. But now we were as those who heard them not. We were gazing upon a scene that shut out everything else. “There stood revealed the throne of God. Around it were ten thousand times ten thousand and thousands upon thousands, and close about the throne were the martyrs. Among this number I saw the very ones who were so recently in such abject misery, whom the world knew not, whom the world hated and despised. “A voice said, ‘Jesus, who is seated upon the throne, has so loved man that He gave His life a sacrifice to redeem him from the power of Satan, and to exalt him to His throne. He who is above all powers, He who has the greatest influence in heaven and in earth, He to whom every soul is indebted for every favor he has received, was meek and lowly in disposition, holy, harmless, and undefiled in life. “’He was obedient to all His Father’s commandments. Wickedness has filled the earth. It is defiled under the inhabitants thereof. The high places of the powers of earth have been polluted with corruption and base idolatries, but the time has come when righteousness shall receive the palm of victory and triumph. Those who were accounted by the world as weak and unworthy, those who were defenseless against the cruelty of men, shall be crowned conquerors and more than conquerors.’ [Rev. 7:9-17, quoted. ]” (21MR 326; underlining supplied) Read the following paragraphs where “They have come out of great tribulation” and Rev.7:10 is again quoted, to assure yourself that the “great multitude” does indeed, share that experience with the 144,000.
 see Revelation 4:9. Although I added the word “temple,” go back and restudy verse 1 where “a door was opened in heaven” which must be the entrance into the heavenly sanctuary.